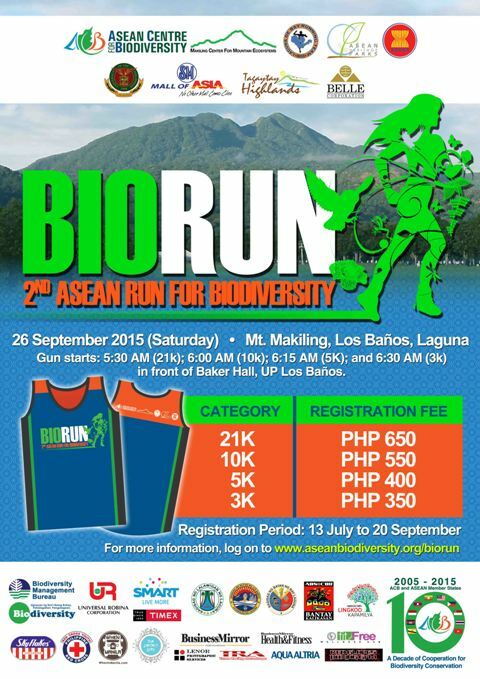 BIORUN is the 2nd ASEAN Run for Biodiversity that is designed to promote the Mount Makiling Forest Reserve, an ASEAN Heritage Park; and to raise resources for the ASEAN Biodiversity Fund (ABF), a sustainable financing mechanism to continue implementing biodiversity conservation activities in the ASEAN Region. If you are one with us in advocating for biodiversity conservation and if you want to experience the majestic beauty of Mount Makiling Forest Reserve, then you should fill out the registration form now. I am not a runner, why should I join? If you just want to try something new with your family and friends while giving back to Mother Nature, then our 3-km race course is perfect for you. I’m a runner, and I have already participated in A LOT of runs/marathons. How is this different from the others? BioRun offers lung-busting, tortuous uphill roads at the foothills of the legendary Mt. Makiling; canopies of lush greenery and unpaved forest trails; fresh, unsullied mountain air; a spectacular view of Laguna de Bay and its surrounding municipalities; the idyllic charm of a quaint university town; and the list goes on. How can I join BioRun? Registration forms are downloadable within this site. Make sure to read the RULES and REGULATIONS portion of the document to be guided accordingly. What do I do before the run? Prepare yourself physically and mentally for the run. Do some stretching and running, weeks before the event. However, make sure not to burn yourself out and mix your training with some walking. Warm up, eat well, and most especially, have fun! The event will push through--rain or shine. However, if there is a typhoon or unfavourable weather conditions, please wait for official announcements. Why do I need to see Mount Makiling and what are ASEAN Heritage Parks? Mount Makiling Forest Reserve (MMFR) is a dormant volcano that is abundant with biological resources; hence its declaration as an ASEAN Heritage Park (AHP) last October 2013. For you to take a peek on what to expect to see in Mount Makiling, please click this link. ASEAN Heritage Parks are protected areas of high conservation importance, preserving in total a complete spectrum of representative ecosystems of the ASEAN region. The ASEAN Centre for Biodiversity (ACB) serves as the Secretariat of the AHM Programme. The breathtaking view of Mount Makiling will make it really hard for you to stop taking pictures. It is okay to take photos, but please watch your step and avoid obstructing the way for other runners. Another favor though, should you upload your photos of the event into any of your social media sites, please use the hashtag #ASEANRunForBiodiversity so we can find your photos easier. What about my pets? Can I bring them? Or can I run with someone on strollers or wheelchair? Sure you can, but only those who will be running in the 3k category can bring them along. Where do I go after the run? Please proceed to the holding area and wait for the announcement of winners. What can I bring home after the run? All participants will receive certificates of participation, race singlets, race bibs, and baller IDs. The best runners will also receive medals, finisher shirt (for 21K), and cash prizes. Where will the proceeds of this run go? Proceeds from this benefit run will go to the ASEAN Biodiversity Fund (ABF), an endowment fund that will help ACB become more responsive to the needs of the ASEAN Member States in conserving and protecting the rich biological diversity of the ASEAN Region. Bantay Kalikasan of ALKFI is a partner of the ASEAN Biodiversity.